CMH is not recruiting physicians at this time. We have six board certified family practice physicians, six advanced registered practical nurses, CRNA and a general surgeon on our active medical staff. Please click on the the "Physicians" tab and then select "CMH Physicians" for a complete listing of our active medical providers. 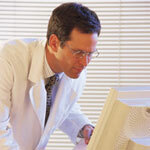 For a list of our consulting physicians please click on "Consulting Physicians". For more information about our hospital facility see our physician recruitment flyer. Marysville, Kansas is a beautiful area with an interesting history. Learn more about our region and our growing community.